The Venette Convention has always remained independent, but it is about to become the flashpoint for a tense military standoff between the two power blocs now dominating interstellar space—the United Federation of Planets and the recently formed Typhon Pact. The Venetan government turns to the Typhon Pact’s Tzenkethi Coalition for protection in the new order, and has agreed to allow three of their supply bases for Tzenkethi use. But these bases—if militarized—would put Tzenkethi weapons unacceptably close to Federation, Cardassian, and Ferengi space. While Captain Ezri Dax and the crew of the U.S.S. 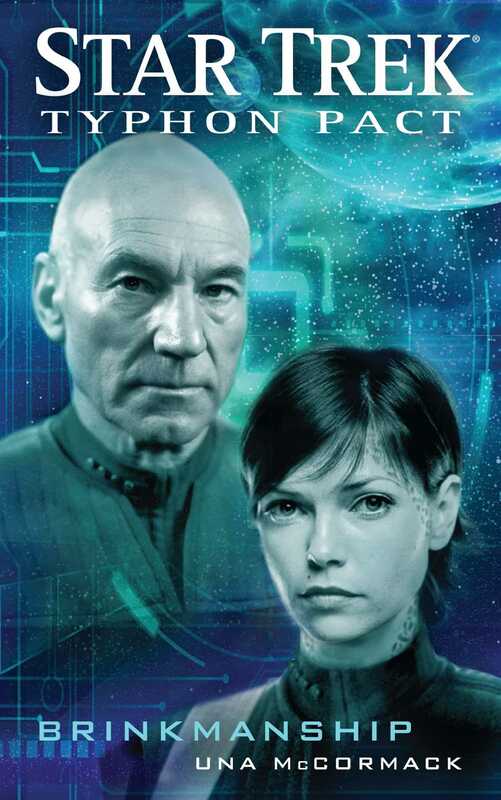 Aventine are sent to investigate exactly what is happening at one of the Venette bases, Captain Jean-Luc Picard and the U.S.S. Enterprise are assigned to a diplomatic mission sent to the Venette homeworld in order to broker a mutually acceptable resolution. But the Cardassian delegates don’t seem particularly keen on using diplomacy to resolve the situation, which soon spirals out of control toward all-out war. . . . In the name of our most beloved and exalted Autarch Korzenten Rej Tov-AA, and in defense of the perfection of his borders, we serve and salute you! The complex chatter of the administrators above, the silent attentiveness of her workmates around her—Neta Efheny spent her days with her head down, her mind empty, and her recording devices primed, and she did not speak or look around. Until today. Today, Neta Efheny was going to make a mistake that would change three lives forever and put whole civilizations at risk. A few skyturns from now, as her mission to Ab-Tzenketh came to its violent and wholly unexpected conclusion, Efheny would have just enough time to reflect again upon the error she was about to make, the uncharacteristic lapse of attention that would cost at least one life. Sitting on a remote hillside, with a terrified workmate and a hostile and desperate ally, Efheny would think about the steps she had taken that had brought her to this pass. She would watch the twin moons silvering the dark expanse of the lagoon, and she would realize that something in her had changed that could not be changed back. She would suddenly understand the extent to which she had acclimated. She would understand that she had gone native. Step by incremental step, move by minute move, Neta Efheny had settled into her place in Tzenkethi society. That was why she had missed the obvious, which, in retrospect, had been staring her in the face for the best part of four months. Initially, she had been dazzled by Ab-Tzenketh. She had learned to keep her head down, and had kept it lowered for so long that she was barely able to lift it again—it is difficult to see what is staring you in the face if you are looking at the ground. There were good reasons why this had happened, reasons Efheny would understand very well. Tzenkethi society maintained strict boundaries between its echelons. The bioengineering programs instituted decades ago by the ruling cohorts were attempting to embed these distinctions down at a genetic level. As the programs bore fruit, generation after generation, it was a rare Tzenkethi service grade who found herself lifted by her test scores to a higher function. These days, most Tzenkethi felt uneasy about too much proximity to those outside their echelon, an unease that surely went well beyond cultural taboo. One’s pulse quickened and one’s luminosity lessened at the sight of a steely skinned enforcer, not simply because one knew what an enforcer was empowered to do but also because one’s body communicated it, physically. Each year, the Tzenkethi leaders believed that they were coming closer to eradicating the effects of nurture upon their population, and that soon nature would control everything. So they would have been horrified to discover Neta Efheny, and for more reasons than the obvious. That she was a Cardassian spy who, for the last two years, had been successfully placed in one of the most sensitive government departments on the Tzenkethi homeworld would have been alarming. But to find something at the heart of their society that transgressed the natural order of things? That would be revolting. Efheny had always been fascinated by the Tzenkethi and their rigid social system. Cardassian to the core (whatever her current physical appearance and bioreadings might suggest), she thoroughly approved of the stability achieved by such carefully designed and maintained hierarchies. The chaos of her own world’s recent history made her crave that stability more than she perhaps understood. And she’d found, over the months embedded on Ab-Tzenketh, that what appeared from the outside to be a monolithic caste system in fact allowed for great variation: differences not just in dialects, for example, but also in tone of voice, or pronunciations of words, or the degree of light emitted from one’s luciferous skin that conveyed deep subtleties. Not even the work that Efheny had done for the thesis that had won her this posting (“Toward a Typology of Social Stratification Among the Tzenkethi”) had prepared her for the rich intricacy of everyday life here. This civilization, Efheny often reflected as she performed her mundane tasks, was like a great symphony in which even the lowliest server contributed to the great harmonic whole. These were the kinds of thoughts that filled Efheny’s head when she was not listening for instructions from her superiors or concentrating on her work. This was probably why she had almost forgotten herself, and was certainly why she had almost missed the obvious. She was too busy keeping her head down and too busy being dazzled. Because sometimes—just sometimes—Efheny forgot. Forgot that her cover identity designated her Ata, bred to carry out the maintenance work necessary to keep any empire going. Sometimes, when she was busy with her tasks, a Fel problem solver or Kre administrator would come down from his or her station on the superior deck, and Efheny would not be able to resist lifting her head just a little to catch a glimpse of these magnificent beings, with their phosphorescent skin and long, strong bodies. Sometimes, when her work was done for the day and she was traveling home to her billet, she would marvel at this glorious world—sun kissed, shining, and blessed with so much water that a Cardassian could not help but stare, however furtively. Stable, controlled, beautiful—no wonder the Tzenkethi systems were policed so jealously by their inhabitants. No wonder they would have been horrified to discover Neta Efheny in their midst, no matter how much she had come to love them. That morning—the morning of her terrible, fatal mistake—Efheny inched slowly back and forth on her knees along the inferior deck of a conference room, rubbing nutrient gel into its intricate coral floor. This had been her function since arriving on Ab-Tzenketh. As Mayazan Ret Ata-E (Ret to designate her as one who received her orders directly from any Ter leader; E to indicate the quality of her genetic stock), Efheny was part of a work unit assigned to maintain a series of chambers that made up a division of the Department of the Outside. In these chambers, Fel problem solvers and Kre administrators of the governing echelon met and formulated briefing documents on Tzenkethi policy toward foreign powers to be passed farther up to the court, where they might even reach the ear of the Autarch himself. As an undercover operative for the Cardassian Intelligence Bureau, Neta Efheny’s task was to keep as close to these discussions as possible, log everything on the numerous audiovisual recording devices implanted in her person, and transmit these files back to the analysts at the embassy. Neither task made much in the way of intellectual demands, although the maintenance work required physical activity, however repetitive. But as both Efheny and Mayazan, she was a function more than a person. Pausing for a moment to examine her cloth, which seemed to be running low on the embedded chemical cleansing agents, Efheny saw, from the corner of her eye, the familiar figure of the leader of her work unit, Hertome Ter Ata-C. Hertome’s genetic profile gave him a slight edge over lower-grade Atas when it came to height, and his Ter designation allowed him to emit a coppery hue to distinguish him from the duller browns of his Ata inferiors. He was also allowed to stand without formal permission when higher functions were nearby. Today, he was waiting near the point where the gravitational field of the anterior deck met that of the superior deck. He had paused in his task of prepping the surfaces of the anterior deck for cleaning and was listening hard to all that was being said by the higher grades above. Efheny gaped. What was he doing? Such an error might easily lead him to be censured. But Efheny’s dismay ran deeper than that. Hertome’s brazenness seemed almost inconceivable. No true C grade would imagine doing such a thing. Whatever those above were discussing was their concern, not his, and best left to their superior capabilities. Efheny, shocked out of maintaining her normal deferential stance, stopped what she was doing and stared at him. It was an error that might well have proved fatal for both of them. Fortunately for Efheny, the four other members of the unit were busy with their tasks and did not notice what occurred next between their two workmates. As if suddenly aware that he was being watched, Hertome Ter Ata-C turned his head and stared directly down at Efheny, kneeling on the inferior deck and staring up at him. He had green eyes, ovoid, and flecked with gold, ordinary enough for a Tzenkethi—but somehow, unmistakably, not . . .
Efheny clenched her jaw. Seeing the movement, Hertome blinked—once, twice—and then, from the narrowing of his eyelids, Efheny knew that he’d guessed that she too was not all that she seemed. She cursed under her breath. She had stared up at him for too long, far longer than any true Tzenkethi server of her grade would at a superior. In a few short seconds, she had given herself away. But then, so had he . . .
How had she not seen this? Hertome had been her superior for eight twin-months. How had she not known? He was human! The use of her name, the personal pronouns, and the formality of his sentence structure reminded Efheny of the parts they were meant to be playing. In fact, it was a most appropriate communication between them, mindful of the differences in their respective grades but granting her the opportunity to speak. Efheny made a gesture of respectful supplication, dimmed further what glow was emitting from her skin, and held up her cloth. There is an order and a purpose for all things. Eventually Hertome and the other wall worker provided harmonies. By all outward appearances, they were a happy and productive unit, and no doubt the Fel and Kre work groups sitting above were comforted to hear the simple chant being murmured below them. Usually Efheny was soothed by participating in these songs, but today her stomach turned queasily, and her hands shook as she cleaned. Because she knew that her immediate superior in Maintenance Unit 17 at the Department of the Outside was not Hertome Ter Ata-C but a Federation agent, name unknown. The question now was: Which of them would be first to act on this new information? Which was going to blink first? It’s the little things that kill, thought Beverly Crusher, pushing her mug farther across the table, out of reach of René’s questing, vulnerable hands. The things you don’t notice until they’re hurtling toward you. The tiny things you forget about until all of a sudden they’re critical. René, thwarted in his mission to take possession of her mug, began to frown. Expertly, Crusher picked up his small cup and put it down in front of him. “Juice, sweetheart!” she said. Eagerly, the little boy took the cup. He drank thirstily and gave a wide smile that made his mother’s spirits soar. Across the table of the quarters that they shared on the Enterprise, a padd in one hand and his meal forgotten in front of him, her husband sighed deeply. “Cardassians,” Jean-Luc Picard said brusquely. He put down the padd, stood up, and crossed the room to use the companel on the desk. The screen on the companel shimmered, and then Admiral Akaar appeared, stern and unyielding. Unconsciously, Crusher reached up to straighten her uniform, before remembering she was off-duty, in her quarters, and dressed for dinner with a two-year-old. “Captain,” Akaar said. “There’s been a little change of plan. Cardassians,” he added, steely eyed and wry faced. Picard, quirking up his eyebrows, gestured to Crusher. Quickly, she concealed a sticky bright blue plastic spoon in her pocket, and came into view. “I’m sure things will start to come back to you when you’re there, Doctor. Besides, there’s another reason I want you there.” He leaned toward the screen conspiratorially. Surely this is a secure channel, Crusher thought, even as she and Picard mirrored the admiral’s move. “Is that possible, Beverly?” Picard asked. The channel cut off. Crusher exhaled. Beside her, Picard tapped the table with his fingertips—once, twice—and abruptly stopped. He gave no other sign that he was perturbed at having his plans thrown into disarray so late in the day. Crusher wasn’t fooled. Crusher nodded. The Federation had an unfortunate history with the three systems that comprised the Venette Convention. When she had visited the convention, as Beverly Howard, all those years ago, the Venetans had been in the early stages of establishing links with the Federation. All had progressed smoothly. Ten years ago, they had been on the verge of applying for Federation membership. Then the Dominion War had intervened, followed by the horror of the Borg Invasion, and the political destiny of these three small systems had quite simply been forgotten. Until they’d announced their new trading agreement with the Tzenkethi Coalition, that is. Now the Federation diplomatic service was scrambling to make up the ground lost in a decade. The Venette Convention bordered upon some interesting (not to mention sensitive) spots. “Chen’s going to be disappointed,” Crusher said. “I’d better inform her of the change of plans—” Picard started suddenly, and Crusher turned to look behind her. At the table, René had lost interest in his own drink and had got hold of his mother’s mug. His hands were too small to manage the weight, and the mug was now balancing precariously on the edge of the table. One small push and . . .
. . . Down will go baby, cradle and all. Crusher crossed the room in a split second, catching the mug midway between table and floor. “Nice save,” Picard said appreciatively. “So . . . this friend of yours,” said Bowers. Dax, who had been smoothing down her uniform and looking around the Aventine’s state-of-the-art transporter room to make sure everything was spotless (it was), stopped and thought, Good question. Dax paused. What about shy, gawky, hapless Ezri Tigan, who had found Peter Alden yet another entirely daunting experience that the academy was throwing at her? Had she raised her game? Had she ever raised her game, before Dax? “Even Ezri Tigan?” Bowers said gently. Bowers smiled. Dax twitched her uniform again. Trust Sam to know what was really going on in her head, to guess what it meant for her to be meeting someone who had known her before Dax. It seemed a long time since Ensign Ezri Tigan, half qualified as a counselor and with slightly less than half a clue, had unexpectedly become the host of the venerable Trill symbiont, Dax. She’d been twenty years old. Time passed, and these days the people who had known her as Ezri Tigan seemed fewer and farther between. So when the Aventine had been assigned to collect Peter Alden, an intelligence expert on Tzenkethi affairs, and take him to rendezvous with a diplomatic mission en route to the Venette Convention, Ezri had been struck by the name. The thought of glimpsing that girl again—through someone else’s eyes, and someone whom that girl had admired—was tantalizing. And to be able to show off the Aventine was the icing on the cake. “Most Likely to Be Admiral Before the Rest of Us”? Dax was still a player in that game. The Aventine’s transporter chief, Spon, operated the controls, and Commander Peter Alden of Starfleet Intelligence materialized before them. He was a taut man in his midthirties, all lines and angles, with dark hair graying at the temples and a slight frown etched upon his face. When he saw Dax, a smile softened the tension at his mouth and eyes. “Must be,” Dax said, smiling back. She’d forgotten how good-looking Peter Alden was, and he had one of those faces that become more interesting with age and experience. “Sam will do,” said Bowers, offering his hand. The two men exchanged pleasantries and handshakes.